Normal in one sense would identify every part of my life; yet in another way, normal could never label who I have been or now am. What does it mean to be a normal Christian? 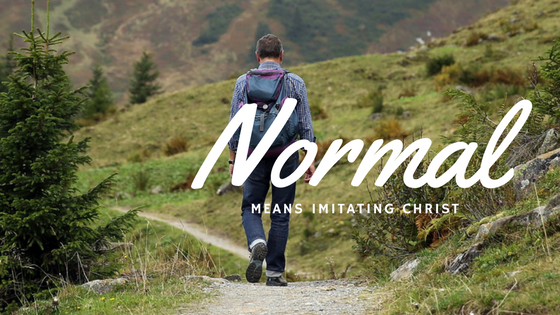 If normal means imitating Christ, we need to examine His normal? What occurred naturally to Jesus? These traits then are to mark our definition of living “normally”. “Then Jesus went up a hill and called to himself the men he wanted. “I have chosen you to be with me,” he told them. passing fully the mantle and anointing to others. This is not my normal yet, but it is the life I am reaching for. These are the distinguishing marks of the gift of life we now possess, because He dwells in us. When I might doubt it is possible, I can read about the lives of believers who walked with Him for those three short years following the example of Jesus. They stepped into opportunities to follow this pattern with confidence and boldness, even if imperfectly! Down through the ages of history, multitude of others set their hearts, minds, finances and abilities to the same goal. They influenced nations and transformed cultures, redirecting the course of church history – affecting and effecting people and communities on every continent through faith in Jesus Christ. It is still the heart of the Father to see the world transformed. He is looking for NORMAL men, women and children who will believe for such a way of life. When we do, we too will be astonished with the difference Christ’s normal makes! There is no “normal” apart from Christ; it requires a relationship of daily walking hand in hand doing as He did. Normal living disconnected from Jesus is abnormal for any who choose to follow Him. Challenging? Yes! Reachable? Absolutely! How else will Christ be seen in me and God be glorified? Normal is never boring or predictable! Come! Let’s see where “normal” takes us. What marks your walk as a Christian? I encourage you to allow this gift of life to generate every part of who you are!